The York Active T120 Motorised Incline Treadmill offers great value for money whilst looking as though it should be in your local gym. It caters for a wide range of athletes, from beginners to intermediate users. This Treadmill is crammed full of features that take the hassle out of working out. 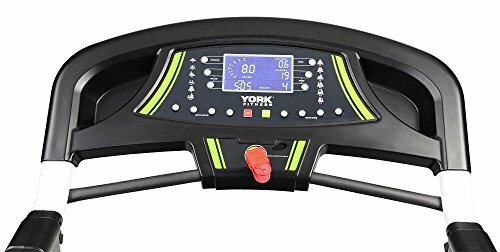 Personally I find having the York T120 Treadmill makes me actually want to jump on and have a run as it is so quick and easy to use with all your controls in front of you and available on the hand rails. As with most York products it is well designed, being easy to assemble, use and maintain. From the moment it arrived I had it up and “running” within the hour. The first impressions of this Treadmill are very impressive with its slick appearance and functionality. I found that the built in MP3 port and speakers to be very useful and a definite bonus to my workout as I no longer had to worry about my earphones falling out mid workout. Once the workout is finished the York T201 can quickly be folded away requiring only a fraction of the space for storage. The York T120 is a popular product with people and has left the majority of people striding towards their goals. A point of interest that I have found from reading feedback is that some of the smaller people who went to assemble the treadmill by themselves found it a little bit more tricky than others as some components are quite weighty. I would keep this in mind when purchasing this product as the vast majority commented on how helpful the people were that delivered the treadmill so it may be worth asking nicely to have them drop it off in the room that you intend to you use it. 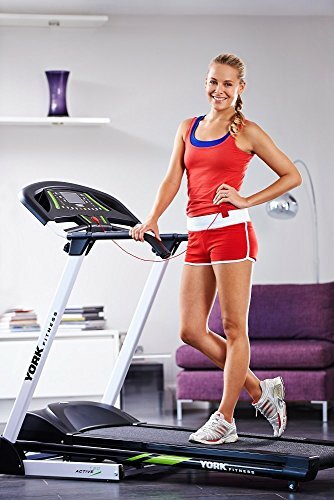 This treadmill is solid value for money as you receive a kit that you would expect to see in the gym but you don’t have those monthly gym memberships which only ever seem to increase each month.